This is a screen capture I made just now of a standard network browsing feature - this is how Mac users see Windows computers on the network. 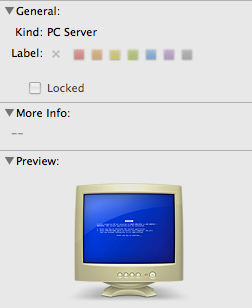 Gotta love the "preview" of how a user experience on a Windows computer feels like: old CRT screens and BSODs. All this "Macs are better" elitism is amusing at times, but very immature. This Penny Arcade comic really got it right.